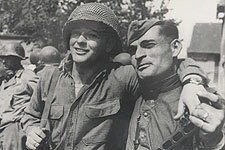 When U.S. and Soviet troops met on the banks of the Elbe River in 1945, they took their meeting to signify the end of Hitler's Germany, fascism and war. The soldiers promised each other to do everything they could to prevent another war. Private Joe Polowsky, later a cab driver in Chicago, took that promise so seriously that he dedicated the rest of his life - and even his death - to promoting understanding between Soviets and Americans, and to the friendship of the Elbe veterans.